I’ve recently started taking a beginners’ hula-hooping course. I was probably as sceptical about it as you are – but actually, it’s turned out to be really fun, and fantastically good exercise. It occurred to me the other day, though, that I don’t actually know how hula-hooping really works! So I thought I’d look it up and work it out – after all, the internet being what it is, someone will have already written about it. 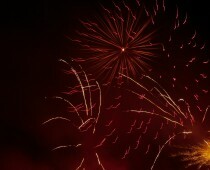 And I was right – I found this site! So with some help, here’s my explanation of how it works – and please forgive my bad drawings! Trying to keep the hoop up while the weight is pulling it down! The friction (F) and weight balance out to keep the hoop level, while the normal force keeps it spinning. 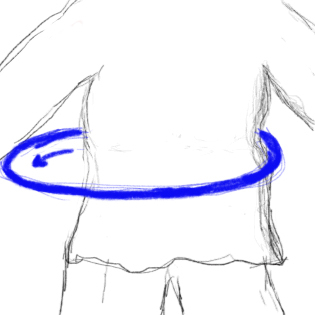 And this is how hula-hooping works! 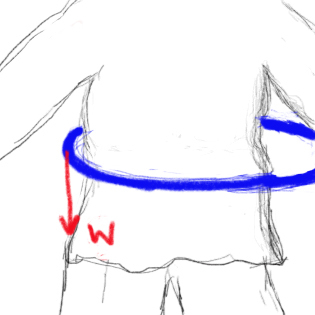 The normal force keeps acting directly outwards, all around your waist as the hoop goes round, which keeps the hoop’s momentum up. I have to say, I’m not sure that knowing how it works has made my hula-hooping skills improve – but it’s still interesting, and a different (and maybe more fun) way to think about weight and friction. Grab a hoop yourself and have a go! Pingback: Hula-hoop i fizyka : Hulajdusza!